"Targeted killing could be the most legal way to conduct warfare"
Harold Hongju Koh ist Professor für Völkerrecht an der Yale Law School. Von 2009 bis 2013 war er Rechtsberater des US-Außenministeriums unter Hillary Clinton. "The Have-Nots Will Decide That It's Not Worth Belonging"
"We made a lot of mistakes. They happen. And then you correct." Many Europeans, including me, have a hard time accepting that targeted killing of terrorist suspects by drone strikes can be legal. Do you think you can convince me? I understand your concern. But let me just give you a thought experiment: Suppose that seven days after 9/11, Congress declares war on Al-Qaida. Suppose Al Gore were president, and he comes on TV and calls for the support of the world, saying; „As of today, we are at war under domestic law against this organization, and we are going to follow the international laws of war in how we conduct this conflict. So, I will not do anything illegal, I will not invade Iraq, torture anyone, open Guantanamo, set up military courts or alienate our best friends, none of these. But here’s what I must do: In the next six months we must identify and find and target the responsible people we are at war with. If we find them in a place where we can capture and try them, we will. But if not, we must use any available technological means, including drones, to remove them from the battlefield.“ Now, if he said that, and if the mission had been accomplished in six months instead of twelve years, I think that the German people would have been supportive. Maybe so. But again, how can targeted killing of people be legal? This is targeting in the context of armed conflict. The Japanese general Yamamoto who ordered Pearl Harbor was targeted and killed in 1943. All signs were he was plotting further attacks. His killing saved lives. And it was lawful under the laws of war. Word War II was warfare, and so was the killing of General Yamamoto. But how does that translate to the fight against terror? Wasn’t declaring a global „war on terror“ one of the most fatal mistakes of the former US government? To call it a global war on terror was a grotesque inflation. Al-Qaida doesn’t operate globally, it operates only in some parts of the world. But President Obama clearly said last week, which I don’t think a lot of people heard: We are not in a global war on terror. We are trying to dismantle specific terrorist networks that are threatening our interests and those of our allies. That is a much narrower statement on what the use of force is for. Let’s get back to targeted killing for a moment. People who may or may not be terrorists are killed, and nobody knows who makes the decisions on which legal grounds, and there isn’t even a remotely similar thing to due process, and if the government screws up nobody will hold them accountable. Let’s distinguish per-se illegality and illegality in the way a particular weapon or tactic is used in armed conflict Some weapons like land mines I consider per se illegal. Torture is per se illegal. But the legality of other weapons like drones depends on the conditions. Drones are a tool. They are not the atomic bomb or something that indiscriminately kills thousands of people. Targeted killing could be the most legal way to conduct warfare, but only if the targets are carefully and lawfully chosen. Look, if you had said this a month ago, before President Obama gave his speech, I would have agreed: We want to tame drones. We want to bring targeted killing into the legal sphere. We want clear standards. We want consultations. Within this administration everyone knows that the German view cannot be taken for granted. But in just last week President Obama has announced a move in this direction, as he should. So the glass is half full. Sadly, I spent the last four years studying Al-Qaida. It’s a coherent, dedicated, effective, transnational organization dedicated to killing civilians, and with no legitimate aims. 23 of the top 30 Al-Quaida leaders have been removed from the battlefield since Obama came in. So, their capacity to commit violence in New York, Madrid or London is significantly reduced. But you don’t necessarily have a particular Al-Qaida leader in the crosshairs before a drone strike is launched, do you? What about „signature strikes“ where a group of unidentified people is targeted just because they match some typical behavior pattern of terrorists? There is an evolution behind this. Say, your target is Osama Bin Laden, but he is hiding. You can’t see his face. But his car is there, his associates are there. These are signatures: the positive selectors are present. The target is a particular person. I think that is lawful, so long as the person is lawfully targeted based on provable past acts. But then you expand: What about a group signature? Based on suspicious activity? Or people might say, if you have this particular kind of car it must be an Al-Qaida safehouse? Then, suddenly, the proposal is to drop a bomb somewhere where you don’t know who any of those people are, based on suspicious activity alone? That’s also called a signature strike. But it is misnamed. It’s really an undifferentiated attack based on external and overbroad signal. If you do it wrong it can violate the laws of war. In his speech, President Obama never said he would eliminate signature strikes. But what he did say is that he will require „near-certainty“ that a senior operational leader of Al-Qaida is present, which amounts to eliminating undifferentiated group strikes. Anwar Al-Aulaqi, a US-born hate preacher, was killed by a drone strike in Yemen in 2011. Many Americans were shocked that his US citizenship didn’t protect him from being targeted. Aulaqi was more dangerous than Bin Laden for the last years of his life. Bin Laden was in hiding. As our Attorney General told Congress last week, Aulaqi told the "underwear bomber" Umar Farouk Abdulmutallab: blow up your plane over American soil. That is a direct command to kill thousands of innocent civilians. Are you supposed to simply let this happen? He was an American citizen, that’s right. Well, if Bin Laden was a German citizen, binational, and had declared war on Germany and had been plotting attacks of this nature, is he immunized because he has a second nationality? The US legal analysis was: It’s not immunity. The question is: Did he declare war by what he did? I think Aulaqi did. His 16 year old son, also killed by drone strike two weeks after and also a US citizen, hadn’t declared war on anybody. I don’t defend this. This was an error. I don’t know how it happened. The US should take responsibility. Obama finally admitted last week: One man targeted, Aulaqi. His son wasn’t. This calls for a review. How do you end a war against a terrorist organization? Wars generally end when you strike a crushing military blow. Then the enemy decides that they are not going to keep this up, and they generally disband. You know, President Obama was correct when he said in his speech that the leaders of Al-Qaida now spend most of their time worrying that they are targeted instead of planning a new attack. Bin Laden himself declared at the end that they can’t fight drones with explosives. They felt overmatched. There was a tool that they couldn’t fight. So, to end this war, you defeat Al-Qaida, you fight and have peace discussions with the Taliban, and you very restrictively define who are the cobelligerents, as the genuine allies of Al-Qaida like Al-Qaida in the Arabian Peninsula, but not any group that comes along. The Boston marathon bombers were home-grown sympathizers, but not members of Al-Qaida. We can deal with them through law enforcement means. What was so important about President Obama’s speech last week was that he made clear that the permanent war footing is distorting of our freedom. For twelve years the US dealt with an aberrational situation with an aberrational paradigm of response. But that aberrational response went on too long. What President Obama said was overdue: The sustainable way forward to counter terrorism does not include Guantanamo, nor does it include opaque and underregulated use of drones. There was a key judgment call in the President’s speech. He said there are two ways forward: perpetual war or exit strategy. President Obama chose exit strategy. And I think the German people should be supportive. There might be other presidents who come in and maybe push for perpetual war. But that’s not a good thing. Germans have generally been very supportive since 2008. But now, in Obama’s fifth year of presidency, some of us can’t help losing faith a little bit. So, I’d say, Max, don’t stop believing! Hold on to that feeling! (Laughs) Look, Obama is not perfect. But he inherited an impossible situation. The worst economic situation since the 1920, three wars, horrible political division. He made certain priorities, and he had to focus on getting re-elected, because if he doesn’t nothing else good can happen. So now he is in his second term, he has three years left and is free to do the things he cares about and he knows are an important part of his legacy. Last week, he could have left Guantanamo on the back burner where it was already, but he didn’t. He said that this is unfinished business. You could say that business should have been finished earlier. But you could also say, at least now, with three years to go, he is finally going to tackle this problem. So, your patience is taxed and many of you say, we will not get fooled again. But I would say, this is the moment when Obama actually needs your support! The moment to encourage him is when he is finally headed in the right direction. What President Obama did in 2008 when he came to Berlin was to build more good will than he was probably entitled to at that moment. When he really needs that good will is now. And to be honest: Who would you have instead? Are you going to want to have his opponents? Are they going to take us off the endless war paradigm? With President Obama, at least, it’s better late than never. What if he doesn’t? What if drone strikes and targeted killing don’t prove to be that effective in finishing off Al-Qaida after all? What if it causes such amounts of unrest in places like Pakistan or Yemen that for every head you chop off the body of the Hydra it instantly grows a dozen new ones? How would that affect the legality of it? You know, this whole story is giving Al-Qaida too much credit. This is a group of 3000 criminals. And probably a thousand of them, if they think they have a better future elsewhere, will leave. You know, if you are 30 years old and you can be a suicide bomber or go back to Yemen and be a part of the post-Arab-Spring life there and get an education and make some money – well, most of these people don’t care that much right now about following Bin Laden. He’s dead, right? So the Hydra theory assumes some sort of infinite vitality of Al-Qaida, as opposed to the notion that they are an organization whose days are gone. Sometimes you believe in the market. People are smart, and if their company is about to fail they get out (laughs). You know, we put these guys on a pedestal, and gave them too much credit. These are hoodlums. Many of them in their 20s, illiterate, had no other opportunities. Take the guy in Boston: He wanted to be a boxer, didn’t make it, couldn’t get a job. Frankly, it seemed to be a function of the bad economy. And remember, when Hercules fought the Hydra, in the end he succeeded, didn’t he? He did kill the beast. But the main thing is to cut off the support. That’s where the Taliban in Afghanistan comes in. Al-Qaida is operating in many different ways. In Afghanistan they are fighting in the field alongside the Taliban. Now in big parts of Afghanistan, women are being educated, the have the internet, they have cell phones. Kabul is the fifth fastest-growing city in the world. Life expectancy has risen by 30 years. If you are a Taliban you would think maybe I should run a business in the 21st century and live to be 80 years old instead of getting myself killed at 25. But in other parts of the middle east you have all sorts of groups affiliated to Al-Qaida that see the Arab Spring as a huge opportunity to achieve their aims. Al-Qaida did the most successful attack, so twelve years later, if you want to show your importance, you say you are also affiliated with Al-Qaida. That doesn’t mean they actually are part of Al Qaida You know, many bands imitate the Beatles, but they are actually not part of the Beatles. But half of the Syrian rebel force actually is part of the Beatles now, isn’t it? There is one thing which we maybe didn’t fully understand. The breakup of the authoritarian governments of North Africa is not dissimilar to the breakup of Yugoslavia after Tito. It’s like the breaking of an iceberg. A lot of weapons released. Ghadafi had nothing if not weapons. And these weapons get in the hands of the Tuareg, and they start to beat the military forces of Mali, and the French are forced to come in. The Syrian opposition is very splintered. That’s the danger with arming these guys. It’s not like the French resistance. How much damage has the war paradigm in the fight against terror done to the trust in the rule of law in the USA? There is damage done. But it should be reparable. Partly because of the generosity of our allies. They know that America has a Jekyll and Hyde way of doing things. I call it the good and bad exceptionalism. Sometimes the Americans can be the most maddening people on earth. On the other hand if you need genuine leadership and commitment they are the ones who are most likely to give it: good exceptionalism So, you need to encourage these positive tendencies and discourage the negative ones. You know, the problem is not so much the use of a war paradigm, per se. It’s the reliance on and extreme „war only“ paradigm, as opposed to a more balanced paradigm. Balanced paradigm means, if Osama Bin Laden is in New York City or in Berlin he is a criminal, you catch him and try him, law enforcement is a totally necessary and sufficient way to incapacitate him. But if he is in Tora Bora in a cave and you can’t get him some other way it is different. The concept of war as something between states needs to be translated to cover a war between a non state actor that operates across borders. What can international lawyers do to reassert the rule of law in the fight against terror? Translate, in one word. We have 21st century problems, we have 20th century law. When the Geneva Conventions were drafted, to be honest, they were not thinking about a guy sitting at a computer changing an „O“ to a „0“. So there are two ways to respond: One is what I called „black hole“. This is the Bush approach: To say that if the drafters didn’t think about it, so there is no law, power controls. You know, Macht, not Recht. The other approach is Montesquieu: the spirit of the laws. Look, Al-Qaida is not exactly like Japan as an opposing force during World War II, but there are laws and we are trying to translate them. You may disagree with the translation, as translators disagree. But we should at least try to debate what the best translation is. The Bush administration’s greatest failure was its refusal to engage in a conversation with its allies. And Obama in the beginning didn’t do enough either on this issue. I think he is trying now. He is saying now I really need your best support, and you can demand things in exchange. Demand transparency, demand consultation, demand more visible standards! Maybe this translation issue won’t be settled until this war is actually won? If it is won everyone will say it’s victor’s justice. The victor makes the rules. But I also think that you don’t make as good rules in the environment of conflict. There is too much at stake. As you know, the important thing about law is how it reasserts itself in the quiet periods. It is very hard to create durable rules on international criminal law while Milosevic is slaughtering everybody. But you and I, we are lawyers, and that is because we are optimists. Because we believe that the more civilized part of human beings will asserts itself in the face of the most fearsome violence. You know, I am from Korea. In 1950 Korea was rubble. Germany? Rubble. 60 years later these are huge economic powers. The human spirit, as educated by life, has incredible restorative capacity, you know? National identities are shaped by these events. The German commitment on international criminal law, its deep commitment against death penalty and fort he peace constitution, all of these are products of history. And my view is, I don’t give up on countries. I don’t give up on people. 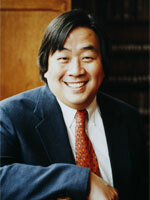 I come from a Korean immigrant family, and now I am the chief international lawyer of the United States. Who would expect this to happen in someone’s lifetime? My family is from a divided country. Their hope is that their country will not be divided, even if with Kim-Jon Un I am not too enthusiastic right now. But now I am in Berlin. I walk the Potsdamer Platz, and I think: Maybe this will happen! As I said, don’t stop believing. Hold on to that feeling! (Laughs extensively). Questions were asked by Maximilian Steinbeis. SUGGESTED CITATION Koh, Harold Hongju: "Targeted killing could be the most legal way to conduct warfare", VerfBlog, 2013/6/05, https://verfassungsblog.de/targeted-killing-could-be-the-most-legal-way-to-conduct-warfare/.